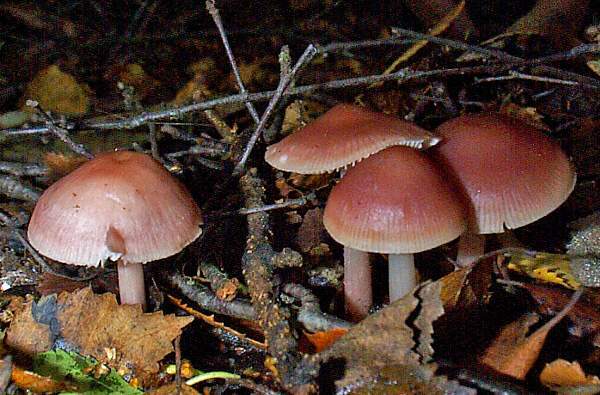 The Rosy Bonnet, Mycena rosea, a larger relative of the Lilac Bonnet, Mycena pura, appears in leaf litter usually beneath deciduous trees. 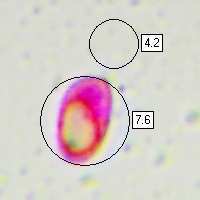 This is a poisonous species and should not be collected for food; it contains the dangerous toxin muscarine. 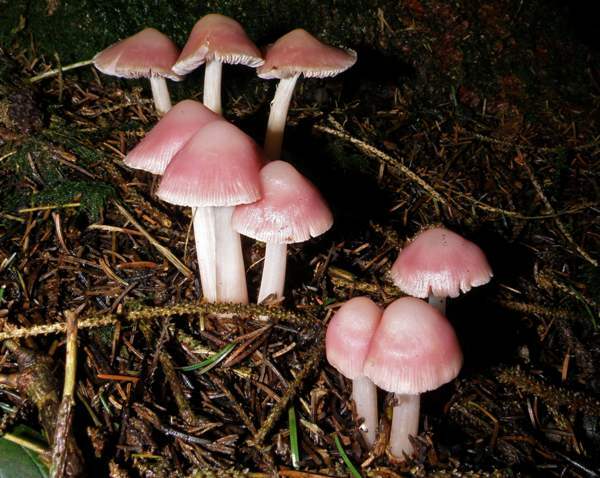 Although generally considered fungi of broadleaf woodland, Rosy Bonnets are also fairly common in coniferous forests on acidic soil, where they often form picturesque groups or lines close to tree trunks. 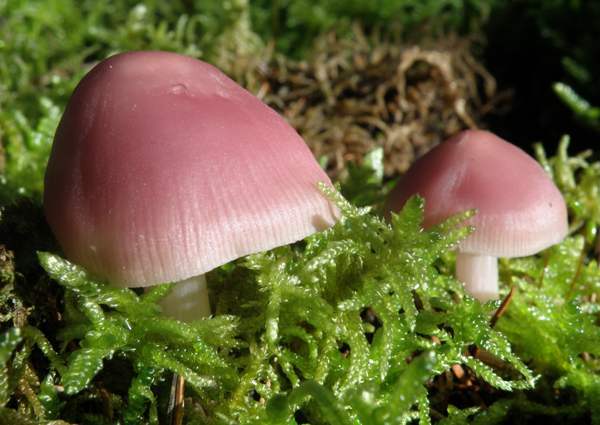 Less common and more localised than the very similar but typically smaller yellow-to-lilac-capped Mycena pura, which is commonly known as the Lilac Bonnet, Mycena rosea is found throughout Britain and Ireland as well as in many parts of northern and central mainland Europe. 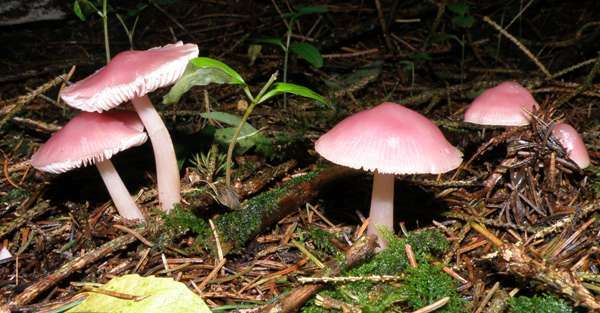 Just as Mycena pura occurs in North America, so also do pure pink bonnet mushrooms which correspond macroscopically and microscopically to the formal description of Mycena rosea; however, in the USA not all mycologists accept that these are two separate species, although there is some evidence that the toxic chemicals in the two are not quite the same. The currently-accepted scientific name of the Rosy Bonnet dates from 1912, when Prussian-born mycologist Eugen Gramberg (1865 - 1945) transferred this woodland mushroom to the genus Mycena, thus making its scientific name Mycena rosea. 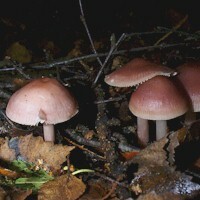 Synonyms of Mycena rosea include Agaricus roseus Bull., Agaricus purus a roseus (Bull.) Pers., Mycena pura f. rosea (Bull.) J. E. Lange, and Mycena pura var. rosea (Bull.) J. E. Lange. The specific epithet rosea comes from Latin and means rosy or pink. The beautiful Rosy Bonnet mushrooms shown on the left were photographed in the Lot Valley in France. They look delicious, but sadly these are toxic toadstools (see below). Often persisting until the first frosts of winter, Mycena rosea is a very attractive bonnet mushroom and is most commonly found beneath beech trees and on roadside verges bordered by beech hedges, but I have found this species also in spruce plantations. 2 to 6cm in diameter, the caps of Mycena rosea are more bell-shaped and rather larger than those of the closely related species Mycena pura. 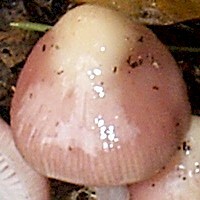 The hydrophanous caps vary in colour from almost white to a deep pink, becoming paler with age and when desiccated. 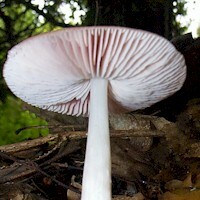 Pallid pink and crowded, the broad gills are deeply sinuate. White or pale pink, smooth with longitudinal fibres, the hollow stem tapers only slightly towards the apex. There is no stem ring. 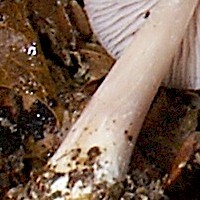 The base of the stem is slightly downy where it enters the leaf litter. Ellipsoidal, smooth, 7-9 x 4-5.5μm. When crushed, this bonnet mushroom smells strongly of radish; it also has a radish taste. 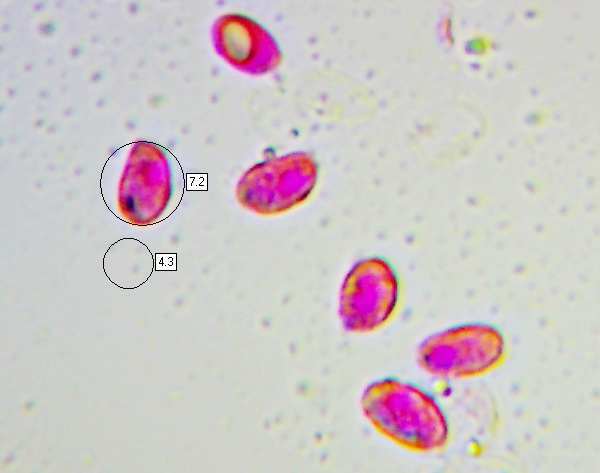 Saprobic, among leaf litter in deciduous woods and mixed woodland. Mycena pura is usually slightly smaller and has a lilac (or occasionally yellowish-grey) cap with a central umbo; its spores are smaller. Some mycologists still treat these as two varieties of the same species. 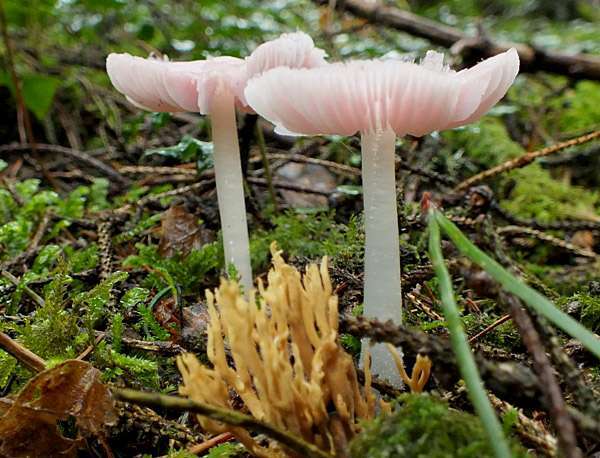 Mycena rosea looks innocent enough, but it contains the deadly toxin muscarine, albeit in low concentrations; it must therefore be considered inedible and potentially poisonous. Do not eat these toadstools!